Jesse Aguirre’s family could not afford a funeral and so they left his body at Cook County’s morgue. The county buried him this spring. In a corner of Mount Olive Cemetery in Chicago’s far north side, wooden sawhorses and orange plastic cones sat as if part of a construction zone. But then, several hearses drove-up and 23 adult coffins were placed on the sawhorses. Cook County usually buries unclaimed bodies in the warm months, when the ground is soft and burials are easier. The burials include many people whose families cannot afford funerals. Jesse Aguirre clutched a handful of flowers. He walked up to a man with a clipboard and asked which car was carrying his father, also named Jesse Aguirre. The man pointed. The Aguirre family watched as a plain wooden box was pulled out of the hearse. “He passed four days before Christmas, so December 21st,” says Jesse of his dead father. 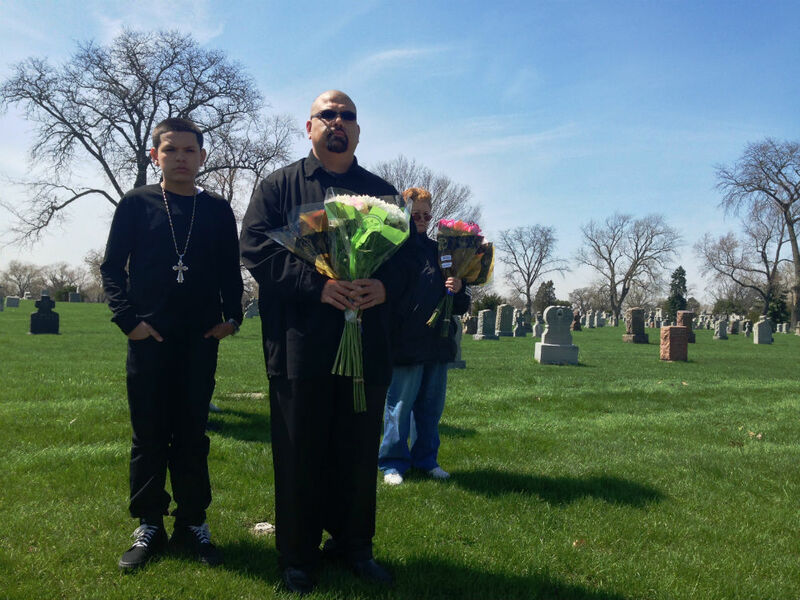 The family has been waiting four months to bury Jesse Aguirre. They say they did not claim the body because they couldn’t afford a funeral. Jessica Aguirre is wearing a t-shirt with her grandfather’s birth and death date on it and a picture of him, beaming. “He was a great guy. Always smiling,” she said. Jessica said she was heartbroken when her family could not bury her grandfather. “I was waiting and waiting and waiting. (I was) actually trying to work as much as I could so I wouldn’t accept that he was gone,” she said. Jessica said it was not until she saw her grandfather put in the ground, that she finally accepted his death. “He’s going to be here, so I can always come and visit him,” she said. The Aguirre family hugged county staff and thanked them. The burial was the result of a collaboration that started in a dark time for the Cook County Medical Examiners Office. About two years ago, media reported that the morgue was overcrowded. Bodies were stacked on top of one another and the remains of stillborn babies were tossed into boxes. Marty Flagg, Vice-President of the Cook County Funeral Directors Association, saw pictures on the news. “The first thing that ran through my mind was ‘some action needs to be taken for these people to get them buried.’ And immediately I picked up the phone and called a couple of other members of Cook County Funeral Association and said ‘I got an idea’”. Flagg proposed that funeral directors volunteer their services. At the same time, the Archdiocese of Chicago decided to donate funeral plots. Roman Szabelski is with Catholic Cemeteries. “There is an old quote, I wish I memorized more of it, it said, ‘See how a community treats their dead and you will learn a lot about that country,” said Szabelski. The Funeral Directors Association and Catholic Cemeteries have buried about 200 people over the last two years. But this is the last burial with the donated plots. Burials will continue at Homewood Memorial Gardens Cemetery where the county has a contract. Homewood also came under attack a few years ago for mishandling indigent burials. But the county says a lot has changed since then. “Right now, we are changing all our processes and looking at them very carefully,” said James Sledge, Executive Officer at Cook County’s Medical Examiners Office. The county has a purchased a new cooler and passed an ordinance that allows cremation. Cremation may save the county money and prevent overcrowding in the future, but so far, few bodies have been cremated. “At the moment, burial is still the preferred method for everyone in Cook County,” said Sledge. The county says it will not creamate any unidentified bodies because someone could eventually claim them, or they could be needed in an investigation. Their website currently lists 36 unidentified remains-- a man with tattoos of wings found in an abandoned building and a young female found in a parking lot are among those listed. Sometimes, the public website has pictures of the bodies to help identify them. The site also lists the names of 83 people who have been identified but are unclaimed. Most of the time loved ones do not show up for the burials. But today, each body has a volunteer, usually a funeral director, who will stay until the body is buried. Chrissy Knauer Fisk works at a funeral vault company and volunteered to accompany Roberta Hall’s body. “I’m honored to be Roberta’s person,” she said.